Imagining the Chinese Martial Arts without Bruce Lee: Sophia Delza, an American Taiji Quan Pioneer. 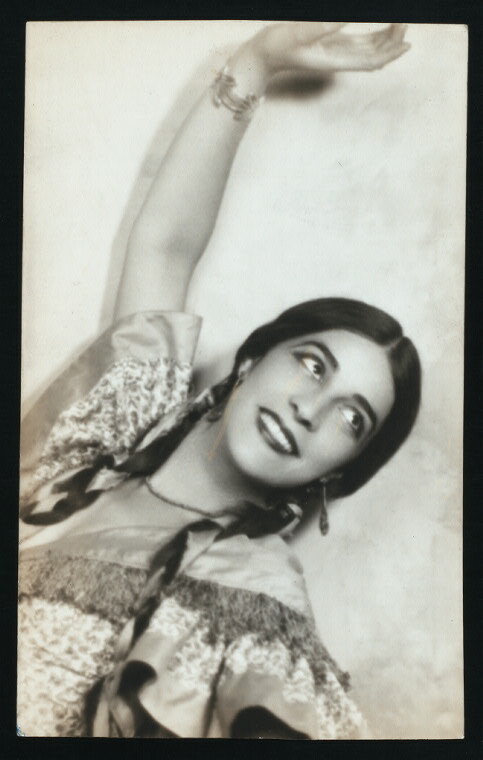 Sophia Delza performing a spanish dance, sometime in the 1920s. Assume that we find ourselves in a very specific, recognizable alternate universe. It is almost exactly like ours, but in this world Bruce Lee never came to America. Maybe he got along fine with his father and simply followed him into Taiji and the Hong Kong film industry. Would this have affected the development of the traditional Chinese martial arts in the west? I think there can be no doubt that the answer would be yes. On the one hand I still believe that the Chinese martial arts would have been introduced and popularized without Bruce Lee. Other Asian arts, like Judo and Karate were growing and finding a receptive audience. It is clear to me after conducting an extensive literature survey of the period (including every article published in Black Belt Magazine in the 1960s) that readers were interested in and actively seeking out information on other traditional fighting systems. Given the importance of the Chinese arts to the development of the more popular Japanese systems, and the large number of Americans coming into contact with them in Taiwan, it is clear that eventually they would have found a following in the west. I do not think that individuals like R. W. Smith or Don F. Draeger would have had any trouble finding an audience for their books without Lee. Yet what would the Chinese martial arts community in America have looked like? Who would have been attracted to these arts? What arts would have been popular? Would there still have been a Kung Fu craze in the 1970s? As we delve deeper into our counter-factual scenario the questions become harder to imagine. Yet I suspect that this is a very worthwhile exercise. The inherent richness of the Chinese martial arts means that they could have possibly become many things in the west. What we see before us today is only one of those possibilities, shaped and crystallized by the economic forces of consumer culture. The image of Bruce Lee interacted with American popular and consumer culture in profound ways. Without him the movement that emerged might have looked very different. To get a sense of what might have been I would like to turn to trends that were already developing in the middle of the 1950s and the early 1960s, just before Bruce Lee appeared as Kato and really started to redefine the western discourse on the traditional Chinese martial arts. This means that we need to think about some of the earliest individuals to publicly teach the Chinese martial arts in America. As we saw in a previous post Lau Bun is generally credited with being the first individual to open a public martial school. However, given the racial atmosphere of the country, initially he only taught Chinese students. Further, the martial arts did not yet have a broad-based appeal within even the Chinese American community, so throughout the 1940s enrollments were light. Sophia Delza lived the sort of life that would make a good movie. She was born in 1903 to a family of some means and distinctly liberal political views in Brooklyn NY. She had a number of very accomplished siblings, including one sister who was an early pioneer of modern dance, a brother who became noted documentary film maker (he was later black-listed by the McCarthy Committee), and a younger sister who became an early practitioner of psychoanalysis in America. Sophia was interested in the intersection of culture and dance. She had formally studied Spanish dance, and had actually toured as a performer in that style on occasion. An extended stay in China (almost four years, 1948-1951) opened vast new horizons. Upon returning to New York the couple rented a suite at the Chelsea Hotel which they called home for the rest of their lives. Cook resumed his career, ending up a union administrator, before an eventual retirement where he restored Chinese antiques for the Metropolitan Museum of Art and resumed his career as a painter (putting on multiple successful shows before his death in 1985). Sophia’s career moved in a more radical direction. She started to tour the country giving lectures on Chinese theater and physical culture. These were well received and it seems that while Taiji came up in this period it was not her exclusive focus. Things started to shift in 1954. In that year she gave her first official Taiji Quan demonstration at the prestigious Museum of Modern Art (the MoMA) in Manhattan. It is interesting to think for a moment on how this historic event was being staged. In 1954 there were virtually no public performances or demonstrations of any sort of Chinese Martial Art at all. Catching a glimpse of Lion Dancing at the Lunar New Year was the closest that most American might ever come to seeing the Chinese martial arts. The MoMA houses the works of modern masters, individuals like Pablo Picasso, Andy Warhol and Jackson Pollock. From the moment of its first introduction Taiji Quan in America was not accepted as counterpoint to western boxing, but as an expression of sophisticated and progressive culture. It is hard to come up with a more striking contrast to Bruce Lee’s reimagining of the Chinese martial arts through the medium of pop culture entertainment (like his role in the Green Hornet). The MoMA demonstration was a critical success, enough so that she went on to open the Delza School of Tai Chi Chuan at Carnegie Hall where she would continue to train students for decades to come. Nor was this the end of her attempts to promote Taiji. In 1956 Sophia staged another high profile demonstration of Wu style Taiji at the UN building in Manhattan. Again, her presentation was well received and she opened a second school on the premises of the UN where she taught classes to delegates and staff from around the world (including Asia). Apparently in this early period she also opened a third class at the Actors Guild. Period photos of Delza leading a small class at the UN. Popular Mechanics, October 1960. It is interesting to pause for a moment and place all of this in its proper historical context. Ed Parker, opened his first commercial Kempo Karate club in Provo Utah in 1953. Bruce Lee would not start to teach in Seattle until 1959. But already by that point Sophia Delza had hosted two very high profile public demonstrations and started three schools, all in New York City. In 1960 Sophia gave the first televised Taiji Quan demonstration in the United States. Audience response was good and it led to greater popular interest in her work. 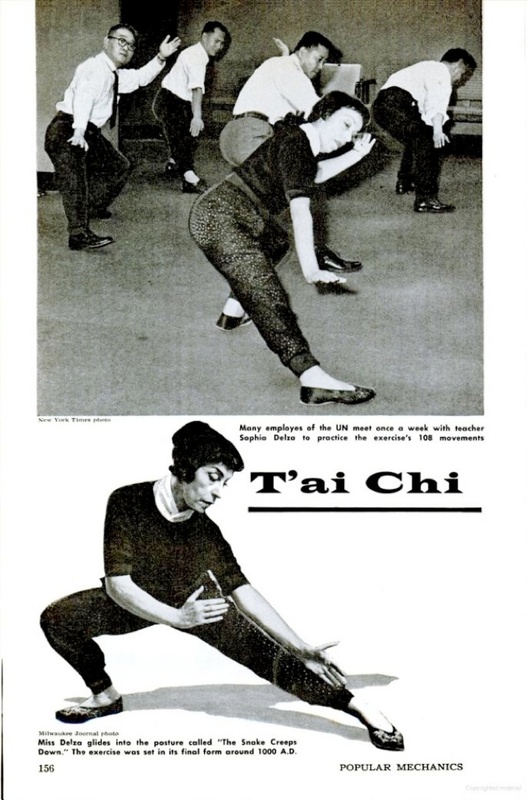 In October of 1960 Popular Mechanics published an article on her teaching (complete with a photo of her running a class of Asian men at the UN) titled “Tai Chi for your Muscles.” This was important for a variety of reasons, Black Belt Magazine, which would become the publication of record for the martial arts community, did not start publication until 1961. Popular Mechanics, on the other hand, had been running articles and advertising campaigns for Asian martial arts (mostly Judo) since the middle of the 1940s. If you were looking to promote a martial art, this was where you wanted to be seen. It is also interesting to note that in this article Sophia goes to some lengths to argue that Tai Chi Chun is an aspect of Chinese boxing. While she teaches the art as a form of physical conditioning (as opposed to energy work or dance), she discusses the fact that various Wu style boxers in Shanghai have defended the honor of the art with the boxing skills that they mastered. Given that Delza is so frequently criticized in certain Taiji Quan circles today for not emphasizing the “martial” value of the art, or not seeing Taiji Quan as a “complete art,” this is worth some consideration. It is certainly true that many of the masters of Taiji Quan, especially those who came into their own in the 19th century, were competent fighters. They often had careers that demanded as much. Yet when the push was made to start to teach these arts more broadly in the 1920s and 1930s it was obvious to everyone that this would no longer be the case. The Nationalist Party wished to “strengthen the nation” and make them better able to resist foreign aggression. Yet it was never imagined that the people would resist by fighting the Japanese with their bare hands. That only happens in Kung Fu movies. China had a fully modern military by the 1920s, and it was not afraid to use it. Rather, the new goal of the martial arts was to improve the actual physical health and welfare of the nation. This was a public health and hygiene program as much as anything else. Its goal was to make the people “strong” and “healthy” not is some abstract sense, but in a very real and practical one. This then was the task that martial reformers from the 1910s-1930s set for themselves. New types of forms were invented, and new modes of classroom instruction were created, so that the reimagined traditional fighting arts could be brought to the masses. This did not just happen in Taiji community, it happened in many places and it was supported by groups like both the Jingwu (Pure Martial) and Guoshu (National Arts) movements. Ma Yueh Liang and his wife Wu Ying Hua were both trained under brutal conditions to be effective fighters. Further, they did pass that skill on to a small number of students who were both trusted and interested in learning it. But the truth is, all talk of “secret indoor techniques” aside, very few students in the 1940s-1960s were all that interested in Taiji as a form of boxing. That just did not fit the world view or expectations of this new generation of students. And it is still the case today. Adam D. Frank has conducted extensive research on the Shanghai Wu style Taiji clan under Ma and Wu. His research found that only a small fraction of the students of these two renown boxers ever expressed interest in anything like serious push-hands training. Nor is this restricted to Wu clan. Frank estimates that in China today there are literally tens of millions of individuals who have studied Taiji casually. Of these maybe a few million have really dedicated themselves to the art. Of those maybe only a few tens of thousands have ever actually taken up a serious study of Taiji as boxing. Its a topic that is just not all that popular in China, even among relatively dedicated students. That is important to remember when evaluating Sophia Delza’s understanding of the nature of Taiji. She very much viewed it as a form of physical culture that was part of China’s long boxing tradition, but at the present moment it was taught to “strengthen the nation.” It seems that most of her classmates back in Shanghai probably would have agreed with that sentiment. American martial artists of the period were often looking for more sparring precisely because they were coming out of other, more physical disciplines, such as western boxing, judo and karate. Yet in that sense they were pretty atypical students by the standards of China in the 1940s. Increasingly Chinese Taiji students were office workers or shop keepers worried about their health and wanting to stay young. They had no prior experience in the martial arts and no interest in boxing. This was the demographic that Delza tapped into most directly. In 1961 Sophia released the first English language books on Taiji. In fact, it was one of the first English language books on the Chinese martial arts of any type. It was titled T’ai Chi Ch’uan: Mind and Body in Harmony, an ancient Chinese way of exercise to achieve health and tranquility. The book was published by the Good News press and enjoyed a rather large run, including multiple reprints. The subtitle more or less describes the content of the volume. Throughout the 1960s she continued to teach, lecture and write on Taiji. Most of these later pieces were shorter magazine articles. Further, as immigration standards were relaxed Sophia met other Taijiquan players and continued to learn new forms. She wrote a number of letters to the editor of Black Belt Magazine, two of which were published in the 1960s. It also appears that she sent them at least one manuscript but nothing came of it. In 1970 some European students took an 8mm film of a class inside her Carnegie Hall school. It is an interesting record of an early period of Chinese martial arts instruction in America. In 1973 she returned briefly to China. This was at the nadir of the Cultural Revolution, so I am not sure how much traditional dance or Taiji Quan she would have been able to observe, but it seems likely that she caught up with old friends. A number of her articles and books continued to circulate in the 1980s, though by this point she was a less well-known figure outside of Wu style circles. Her more philosophical approach to the Chinese martial arts as a field of physical culture had lost out to the rough of and tumble of the “Kung Fu Craze.” Her husband of many decades died in 1985. Still, Sophia had many projects to work on. In 1996, the year that she too passed on, the State University of New York Press released her final volume and statement on the Taiji system. It was titled the Tʻai-chi Chʻuan Experience: Reflections and Perceptions on Body-mind Harmony. A later reprint of Delza’s classic work. Today very few individuals outside of the Wu Taiji clan remember the remarkable life of Sophia Delza or the many contributions she made to popularizing and promoting the Chinese martial arts in the West. Still, even this brief review of her career shows that it was studded with a remarkable number of “firsts.” She was a very early figure in the history of the Chinese martial arts in America, and everywhere she went, she had to break new ground. I suspect that there are a few obvious reasons that she is not more widely acknowledged. I think a lot of modern martial artists are uncomfortable with her background in dance and theater, and very much do not want to see “boxing” associated with dance. The fact that she did not care to teach the martial applications of her art are also seen as suspect in a number of circles. Simply the fact that she was an older woman probably did not help. Much of the discourse around the Chinese martial arts in the later 1970s focused on redefining and promoting masculinity. 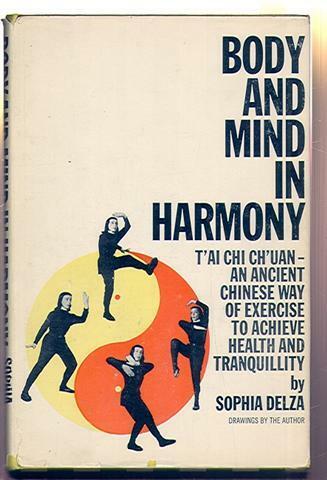 In short, Delza crafted an interesting image and approach to the Chinese martial arts, yet it did not win in the marketplace of ideas. Drawing off her experience in Shanghai, she saw them primarily as a form of physical culture that was both modern and progressive. Yet the arrival of the “Kung Fu Craze” of 1973 changed the terms of this discussion in the Western market. If Sophia Delza had succeeded, what would the Chinese martial arts in America look like? They would probably look remarkably like the cleaned and sanitized arts of the Central Guoshu Institute or the Jingwu Association. Possibly wushu would be much more popular now than it current is. Her approach, while still coming out of the Wu Shanghai clan, fit more neatly with these modernist movements. At the same time I expect that such a Chinese martial arts movement would have been smaller, more elite and confined to those who had a serious interest in China. The lack of serious fighting may have made it more accessible to females. Yet without Lee’s charismatic ability to reach across racial lines and speak to the dis-empowerment and disappointment of modern urban life, it seems likely that the Chinese martial arts community would be less racially diverse than it is today. Still, in reviewing her life and legacy we have not only reclaimed an early pioneer of the Chinese martial arts, but also seen a different aspect of how Chinese martial culture might have emerged in modernity. I should also point out that in many ways Sophia Delza’s life remains an unfinished story. I don’t think anyone has yet undertaken a major biographical evaluation of her career within the martial arts. That could be a very interesting project. Further, she left no fewer than 95 boxes of documents to the New York Public Library including letters, journals, ephemera and unpublished manuscript drafts. I am sure that as this material is studied other aspects of the forgotten history of the Chinese martial arts in America will be brought to light. 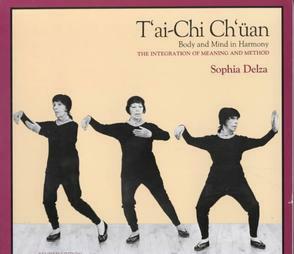 She wrote a book, now prohibitively expensive, which Marnix Wells told me is her own Jungian/Reichian take on Taijiquan! I know one person in the U.K. who learned her form – which appears to have been very much influenced by her Western dance training – as a young man. I was one of her Carnegia Hall studio students in the 70’s. Wish I had continued. I’ve never found another teacher of the Wu style here in Southern California but would resume if I could. What do you remember about her as an instructor or her classes? What were the other students like? Thanks for dropping by. I remember Sophia as a serious and focused person – very regal in demeanor. She would invite her students to her Chelsea Hotel apartment during the holiday season and served traditional Asian delicacies such as “1000 year old” eggs. I was introduced to her by my Uncle who knew her and her husband, Cook Glassgold, from the 1930’s WPA http://en.wikipedia.org/wiki/Works_Progress_Administration. Wonderful and interesting people. Her other students were a diverse group in age, backgroup and ethnicity. One fellow had taught himself from her book, Body and Mind in Harmony and then sought her out for further instruction. I was a student of Sophia’s as well (89-96). What a great teacher and person. A brilliant teacher, always pointing out subtleties at just the right time. It’s true, she had no interest in teaching the martial aspects of the art. She called T’ai-Chi Ch’uan an “exercise art”. After 25 years of practice, I think of it the same way, and I’m still learning. Sometimes, when I’m practicing, I can almost hear her in my head saying, “Oh, no, that’s wrong,” and giving a little laugh. Thanks so much for stopping by and sharing your memories! Do you know if any of her students still meet or stay in touch in an organized manner? Did her school leave any sort of institutional legacy? I have just participated in a class, today, by one of her former students. Doreen, is 90 years old and in amazing shape. is there anyone in the los angeles area practicing the Wu style? From Kung Fu Tea - Sophia Delza, an American Taiji Quan Pioneer.